Red Menace #1, published by Wildstorm Productions, 32 pages, $2.99. The McCarthy Hearings. Those three words provoke many negative emotions to this day. 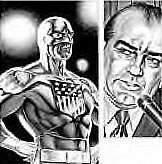 Well, those chilling goings-on in a time when "Commie sympathizers" were supposedly lurking around every corner are the backdrop for a new comic book called Red-Menace. And, despite being set in such a disturbing time in our nation's history, the book itself is a very good read. Penciler Jerry Ordway, inker Al Vey, and colorist Jonny Rench had better stay right where they are. Together, they produce some of the most stunningly expressive and versatile artwork ever seen in comics. Complimentary of the story in the subdued and solemn setting of the hearings as well as in the action sequences, I can't imagine a better team for the book than this titanic trio. What's really amazing about Red-Menace is that, in a day when new superhero comics are a dime a dozen, this creative team has managed to instill their work with a sense of establishment. Rather than seeming like a brand new fictional world, the characters read like they've truly been around for a while. I think I'll stick around for a while myself, and see what happens. Red Menace is recommended for all ages. Find it at comics shops and online retailers and auctions. Failing to read it may put you under suspicion of being a supporter of sub-par comics.